What better way to celebrate the New Year than with a team building event? I know I can’t think of one. 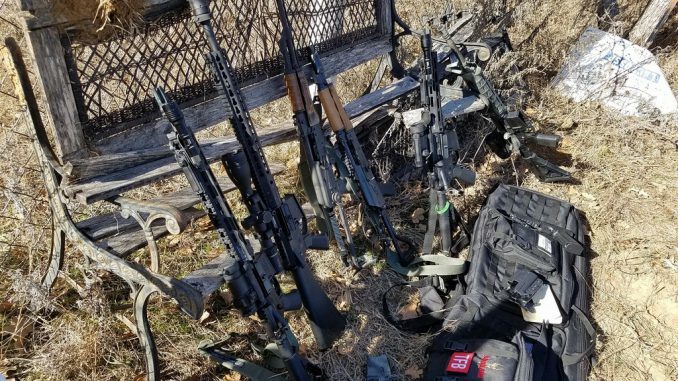 The RifleGear Plano crew loaded up a bunch of guns, ammo, suppressors, and even some Tannerite and headed out to an undisclosed location in the Texas countryside for some new years fun. We set up a pretty solid little spread with canopies, shooting tables, and a TON of steel to shoot at. With everything that has been going on at work, this was a wonderful chance to blow off a bit of steam and just enjoy shooting, something that every single RifleGear employee is very passionate about. We even brought one of our customers along with some pretty interesting guns! He very generously drug out his Barret 50 cal and a semi-auto RPD for everyone to enjoy. Our owner Eiko was even kind enough to donate some ammo for the 50 so that everyone could have a chance to enjoy the sheer power that the Barret has to offer. Shooting one of these bad boys is an experience like none other. Keeping with the 50 caliber theme, our LTC instructor Hammers brought his Desert Eagle chambered in 50 AE along with and let some of us have a go with it. Our customer took some shots at 100 yards and was able to score a few hits with some pretty impressive shooting. I, on the other hand, wanted to see how fast I could run the Deagle on the plates we had set up at about 15 yards. Not only was I successful in running it reasonably quick given the amount of uncomfortable recoil, but the bullet impact on the steel transmitted enough energy to knock over a couple of the targets and break another two of the two-by-fours. Running the plates at 15 yards proved to be a challenge that we all seemed to enjoy and we broke out the shot timer to see how each of us stacked up. With my Glock 19, I was able to post a time of 4.06 seconds for 7 shots on target (two shots on each of the large targets, one shot on each of the small rounds.) Everyone seemed to be about on par regarding skill with one or two of us shooting the string a bit faster. I did pick up our sales associate Johnny’s M&P C.O.R.E with a Vortex red dot on top and was able to run the same drill in about three and a half seconds, that really proved to me how fast a red dot can be. I know that not only myself but some of the other guys out there are shopping for a red dot to put on their guns, it seems to be the way of the future. We all took a bit of a break from the pistols and enjoyed shooting a bit at 100 yards as well as 300 yards. There is just something about connecting with a steel target at that range that is satisfying. The tiny rifle that you see in my hands is a single shot .300 Blackout with a Silencerco Omega on the end of it. The result is a rifle that you can hit something with a .30 cal bullet at 100 yards with ease while being as long as a standard hunting rifle. Hogs and deer beware, this thing is perfect for Texas hunting. So how do you top rifles? With a bigger rifle of course. Time to break the 50 out and really start the party. We loaded up some PMC Bronze and let our customer have at it! There just isn’t words available to tell you how awesome it is to get behind something shooting a bullet that weighs as much as ten 5.56 bullets combined. So you might be asking yourself “did I overlook the Tannerite pictures?” Nope, some things are just too awesome and sometimes you forget to take a photo of it. Rest assured, though, 8 pounds of it at one time is nothing short of awe-inspiring. At the end of the day we had a ton of fun and couldn’t be more appreciative of not only our coworkers but of the owners. Thanks for giving us a day off to go have some fun! Make sure to check out RifleGear’s website HERE to pick up your next firearm.